Sick of hearing about Carmelo Anthony yet? How about shifting your focus to Nuggets big man Nene, who has a one-year player option for next season?In other words, for all the fuss over Melo, there’s another very, very good Denver guy who might also warrant a look. Even in the midst of this new age of point guard glory, big men are still the most valuable commodity in the NBA. Nene may not be famous, and he’s yet to make an All-Star team, but make no mistake —he is very highly regarded around the league. If he decides to go the free agent route, there will be no shortage of suitors; if the Thunder were to add the Brazilian centre, they would have all the key pieces to make a championship run. But like everyone else in the NBA, Nene is nervous about this summer and will likely be looking for a deal before then. That means either re-signing with Denver or getting traded and signing an extension elsewhere. Understandably, the Melo situation comes first. 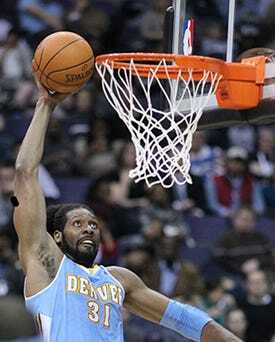 If Anthony is gone, though, the Nuggets will assume they’ve lost Nene, too, and will be looking to deal him. According to several individuals with knowledge of the Rockets’ thinking, the goals of the Rockets’ determined pursuit of Carmelo Anthony are two-fold. Though the primary objective is to beat the long odds to land Anthony, Morey also has continued dialogue with Nuggets executive vice president Masai Ujuri in hopes to have a head start toward a deal for Nene, the Nuggets’ centre who like Anthony can opt out of his contract after the season. Ujuri has proven, thus far, to be somewhat difficult to deal with. Chalk it up to inexperience, or the fact that he has the luxury (for now) of being able to jerk other teams around. Morey may be part of a new generation of GMs who value advanced metrics and unconventional thinking, but here, he seems to be falling back on the oldest trick in the book: Earning the trust of the other party.